Eurograde 4 - Cash rating £60,000 or valuables rating £600,000. Certified and tested European standard EN 1143-1. 60 minutes fire protection for paper tested to NT Fire 017 - 60P. Two high security double bitted key locks supplied with two keys per lock. Supplied with 2 adjustable shelves. True 90° door opening maximises the internal capacity. Constructed using Chubbsafes revolutionary new lightweight barrier material. Stylish contemporary design with an attractive black paint finish. † Add 63mm to external depth for hinges and handle. Construction Double walled steel body and door filled with jointless barrier material to protect against attack. Chubbsafes	The Chubbsafes Trident Grade 4 Size 170 offers high security theft protection and 60 minutes fire protection for documents. One of the range's most prominent features is that the Trident can be customised with the fittings such as shelves and lockable drawers thus allowing the Chubbsafes Trident to meet specific customer needs. This safe is tested and certified by ECBS to European standard EN 1143-1 ensuring Eurograde 4 status and a recommended insurance rating of £60,000 cash or £600,000 valuables. 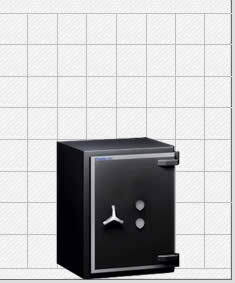 Chubbsafes barriers are applied in the construction of this safe to protect against all kinds of burglary attack. Furthermore passive and active re-lockers are incorporated into the bolt work to increase the already high level of security. The safe door is secured by two high security double bitted key locks, supplied with two keys per lock and the base of the safe is ready prepared for floor fixing. Our price includes bolt down installation to a ground floor location as standard. This model is also available in 6 other sizes.